Tacoma’s own The Sonics can almost certainly lay claim to being the Northwest’s first punk rockers, and some actually consider them the first punk band period. Now, those are some pretty big claims, particularly the second one, and I’m not here to weigh in one way or another – trying to identify a ground zero origin for any style of music is almost always impossible. There were certainly other garage bands in the early 1960s who had a similar vibe to The Sonics, but regardless lots and lots of rockers have cited them over the years as major influences, and they’ve been covered by everyone and their mother. So they must have been doing something right. Even if most people at the time had no idea what they were doing at all. So what are The Sonics all about? They’re about raw intensity. There’s no attempt here to lay down clean tracks. That would completely miss the point. There’s a reason this style of proto-punk is called garage rock – because it sounds like it was recorded in someone’s garage, amidst the trash cans, water heater, and half empty cans of paint that you just can’t seem to get around to throwing away because you just might, might need them someday. You can certainly feel the early rock ‘n’ roll influences – Chuck Berry, Jerry Lee Lewis, etc, but done faster, dirtier, more distorted, and just plain crazier. The songs are quick bursts of machine gun fire spraying the room indiscriminately, with the longest of the album’s 15 tracks coming in at exactly three minutes. “The Witch” and “Psycho” are grungy, harsh classics deserving of their place of honor on the front jacket. Others like “Leave My Kitten Alone” are more straight forward era rockers that sound like they would have been hits had Elvis recorded them. Hell, there’s even a ballad here in “Love Lights” that sounds like it comes straight out of some late 1950s prom. I’ve become more intrigued by these pre-punk garage bands from the 60s. The style reminds me not just of early punk, but grunge as well with the lack of emphasis on a “clean” sound, though grunge tuned it down even further and made it sludgy. I think that’s part of what drew me to punk in the first place – looking for the roots of grunge. And The Sonics are the father of them both. Or at least the drunk uncle who talks a lot of crap. 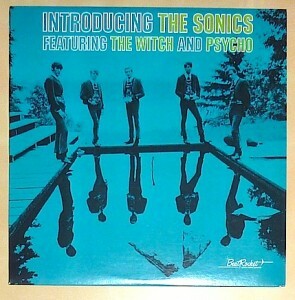 This entry was posted in Punk, Seattle and tagged Introducing the Sonics, Music, Seattle Music, The Sonics by Administrator. Bookmark the permalink.